The 'Dashboard' contains statistics, charts and important information from all C1 modules. This includes service desk tickets, endpoint patch status, operating system breakdown, endpoint security policies and more. Enroll New Device - Endpoint Manager. Opens the 'Device List' page. 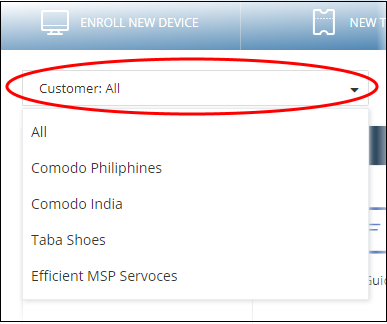 Click 'Enroll Device' to add an individual device. New Ticket - Service Desk. 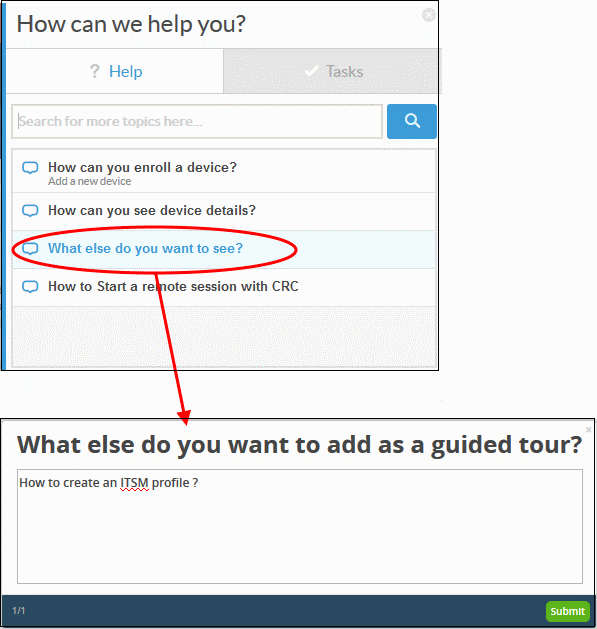 Lets you create a new support ticket in the Service Desk module. New Customer - C1 portal. Create a new C1 customer (MSPs only). Customers you create here will be available in all integrated modules (Endpoint Manager, Service Desk, Quote Manager etc). Enroll Devices in Bulk - Endpoint Manager. 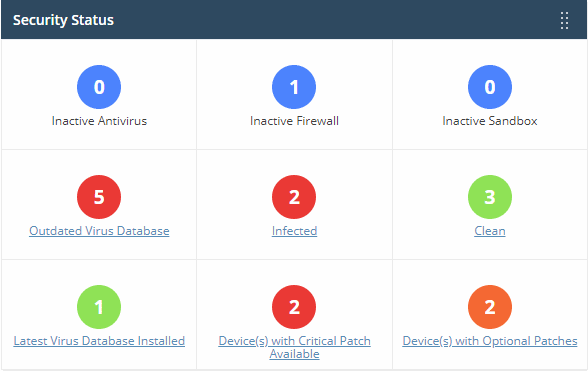 Download the packages required to enroll multiple devices into Endpoint Manager. These include the communication and security clients, and HTTPS proxy server agent. New Opportunity - CRM. Opens the 'Create New Opportunity' page. Select a specific a company. The dashboard will auto-update with your chosen statistics. 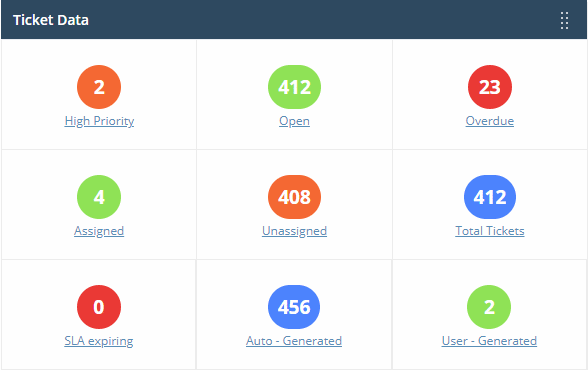 Enterprise customers - the dashboard only shows stats for your company. The dashboard shows bar charts, pie-charts and tables related to the company. You can view, hide or re-order items as required. Use the switches on the right to show or hide an item. The changes are automatically applied. Click the 'Comodo One' logo to return to the dashboard. The number of disabled components is shown next to the 'Customize' link: . Drag-and-drop a row to re-order it on the dashboard or click the menu icon on a tile and move to a new position. Click any link to open the device list page in endpoint manager. From here you can fix items as required. How many tickets are open, overdue and so on. Number of tickets auto-created by C1 applications like Endpoint Manager. Number of tickets created by users. Click any link to view the relevant list of tickets in Service Desk. Click here for more details about managing SD tickets. 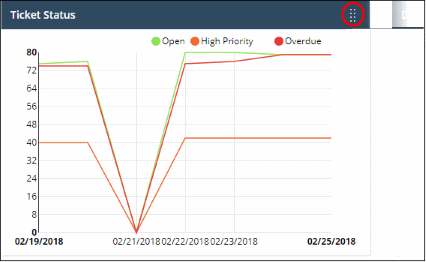 The number of overdue, open and high priority at various points in time. Place your mouse cursor over a section to see the status of tickets for that particular date. If no tickets are available, you instead will see link - 'Click Here to Create Your First Ticket'. See 'https://help.comodo.com/topic-289-1-625-7854-Manage-Tickets.html#create_new_user' for help to create tickets. 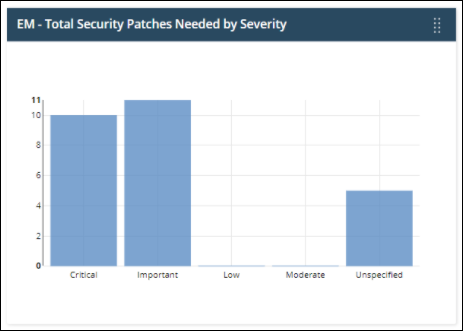 Shows how many of your Windows devices are missing critical and optional patches, and how many are fully patched. 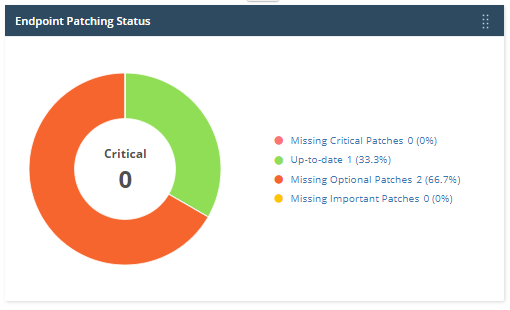 Place your mouse on a sector to view the number of endpoints with the respective patch status. Click a link on the right to view the relevant list of devices in Endpoint Manager. Shows how many of your devices are currently connected to Endpoint Manager. 'Inactive' means devices that have not connected for more than a day. Place your mouse on a sector to view the number of endpoints with that status. 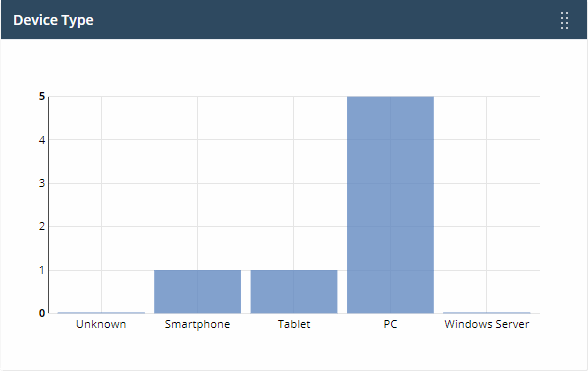 Shows enrolled devices by device type. Types include PC, servers, smartphones and tablets. Device types are on the X-axis and quantity of endpoints on the Y-axis. Place your mouse on a bar to view the number of endpoints of that type. 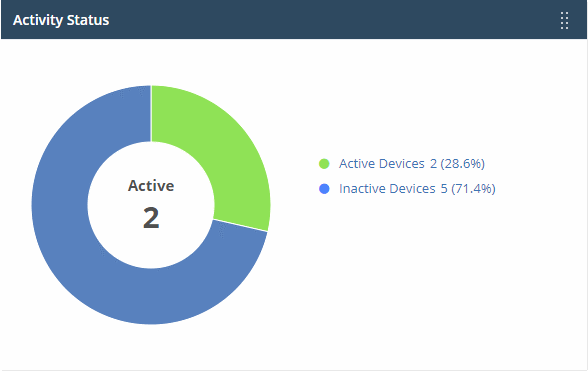 Click a bar to view the relevant list of devices in Endpoint Manager. Shows enrolled devices by operating system. Place your mouse on a bar to view the number of endpoints of that OS. Click a bar to view the relevant list of devices in Endpoint Manager.. If you haven't added any devices yet, then this area will instead show a link - 'Click Here to Add Your First Device'. This opens the 'Device Management' interface. See 'https://help.comodo.com/topic-399-1-786-10126-Enrolling-User-Devices-for-Management.html' for help to to enroll a device. 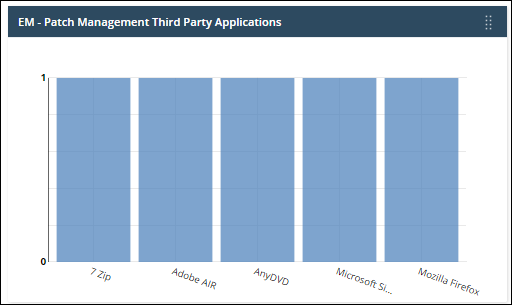 How many devices of each operating system have an active Endpoint Manager profile installed. Operating systems are on the X-axis. The number of devices is on the Y-axis. Place your mouse on a bar to view the he number of endpoints of that category. The number of quotes that have been accepted, published and are in draft status. This widget is only available if Quote Manager is enabled. Click a link on the right to open the relevant list of quotes in Quote Manger. 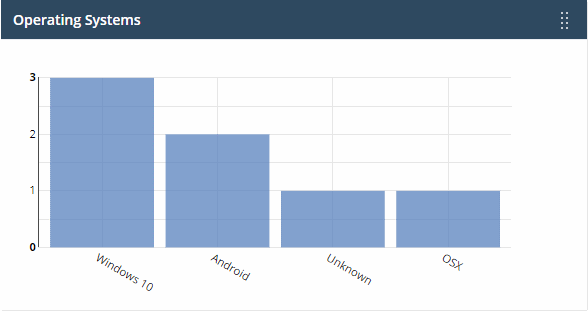 number of devices that require patches. Threats blocked and browsing patterns on devices in your network. This section is only populated if Comodo Dome Shield is active on your account. See the Dome guide at https://help.comodo.com/topic-434-1-840-10755-Introduction-to-Comodo-Dome-Shield.html for more about the product. 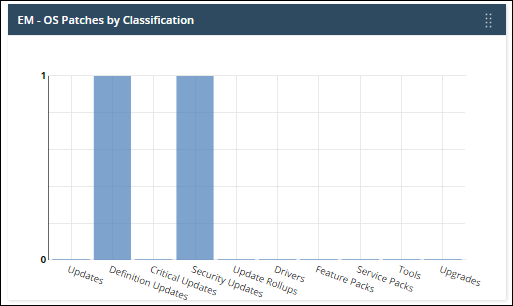 Click any bar chart to open the relevant detail page in Dome Shield. The 'Upgrade' button allows you to subscribe for other Dome products such as Dome Secure Web Gateway and Dome Data Protection. In case of any issues or clarifications regarding the application, administrators can refer to help guides or write to support to resolve them. 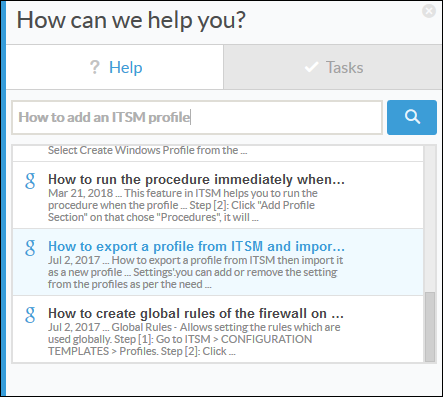 Help Guides – View help guides for C1 modules such as Service Desk and Endpoint Manager. Forum - Opens the MSSP consortium forum page where you can ask questions or join in discussions. Email Support - Send email to our support staff for any issues. Contact Us	- Details of support information. The lower half of the window shows interactive tutorials on specific tasks. 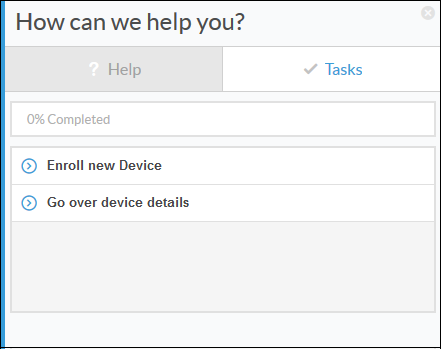 For example 'Enroll new device' tells you how to add a device to Endpoint Manager. Click 'Submit' to send the suggestion to C1. Place your mouse on a bar to view the number of endpoints of that category. Click a bar to view the relevant operating system installed on that device in Endpoint Manager. Click a bar to view the relevant list of operating systems installed on that on that device in Endpoint Manager.